MEXICO CITY — The Trump administration has won the support of Mexico’s incoming government for a plan to remake U.S. border policy by requiring asylum seekers to wait in Mexico while their claims move through U.S. courts, according to Mexican officials and senior members of president-elect Andrés Manuel López Obrador’s transition team. While they remain anxious that the deal could fall apart, U.S. officials view this as a potential breakthrough that could deter migration and the formation of additional caravans that originate in Central America and cross through Mexico to reach the United States. They have quietly engaged in sensitive talks with senior Mexican officials, attempting to offer a diplomatic counterbalance to President Trump’s threats and ultimatums. The prospect of keeping thousands of Central American asylum seekers for months or years in drug cartel-dominated Mexican border states — some of the most violent in the country — has troubled human-rights activists and others who worry that such a plan could put migrants at risk and undermine their lawful right to apply for asylum. Dozens of U.S. asylum officers have been sent to San Diego where they will begin implementing the procedures in coming days or weeks, according to Department of Homeland Security officials. Under the procedures, asylum seekers arriving at the border will be given an initial screening interview to determine whether they face imminent danger by staying in Mexico. One version of the plan, known as a “Safe Third” agreement, was discussed extensively with the government of President Enrique Peña Nieto. It would have barred Central Americans from applying for asylum in the United States, on the grounds that they would no longer face persecution after arriving in Mexico. But López Obrador’s landslide July 1 victory sunk those plans, and senior members of his transition team say a “Safe Third” is a non-starter. U.S. asylum officers and other immigration officials who began receiving guidance this week on the implementation of Remain in Mexico were told the procedures could take effect imminently, but senior officials from both governments say key details remain unresolved. 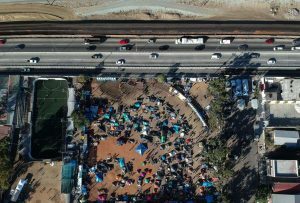 U.S. officials want to roll out the program at the San Diego border crossing to deal with the caravans that have become a source of frustration for Trump, but they envision it could be expanded to another five to seven crossings along the U.S.-Mexico border. Senior U.S. officials said they want more assurances on how Mexico intends to keep asylum seekers safe and to ensure they don’t get deported back to Central America before their asylum claims get resolved.